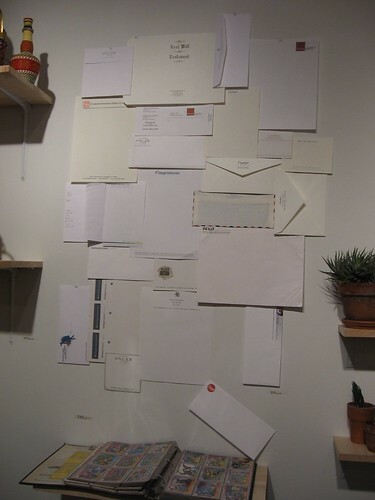 This month, at Copy Gallery, Luren Jenison curated a Collections Show, with entries gathered from the private caches of various New York and Philadelphia obsessives. Slews of ski masks, records, stationery, squeaky toys, succulents, weirdo children’s videos, Family Circus Books— pinned up and spread out like cases of dried butterflies. Three or four entries, in particular, really rang with earnest obsession. Leslie Rogers has been, for some time now, in love with the brown paper bag. She hoards them, saves names and bag-bottoms, follows news in the industry, tabs them with spreadsheets and manila folders, and even makes her own, Leslie Rogers-brand paper bags wholly from scratch. The names on the bottoms, she tells me, refer not to companies or facilities, but to living individuals. They are signatures; team leaders of quality control, perhaps. This is what initially intrigued her about the brown paper bags. The facture as much as manufacture. And to the right, stands a collection of 20th century beer cans, in varying stages of decomposition, by PaintCo, on a rack lovingly built to purpose. A white can generically labeled Beer sits a few shelves above its cousin, Lite Beer. 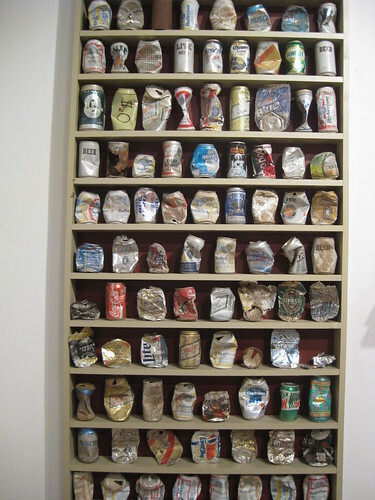 A few cans have imploded into little aluminum supernovae or mangled rust-bunnies. Others are just pleasing as reminders of by-gone design sensibilities. I stared over the collections and thought: there should be a gallery— or a micromuseum— dedicated to a weekly rotation of these kinds of collections. Curio-cabinets of human fixations. The public would never tire of it. K-Fai Steele‘s collection of office stationary gathered from her temp jobs in New York from 2004-2007. What is so transfixing about these fixations? Partially, there’s the raw archaeology of it all. The strict taxonomies. The old questions answered. A recent girlfriend of mine, for instance, would always stumble across brown paper bags imprinted with her surname, Salazar. And now, thanks to Rogers’ dogged investigations, I can trace the origins back to Elizabeth, New Jersey, straight back to the Duro Bag Corporation. Or, through beer cans bent and perforated into drug paraphernalia, I get a better picture of tribal practices in Providence, Rhode Island, during the year 1986. I understand the whole of culture better through some of its smaller parts — tiny pockets of my environment, newly illuminated. 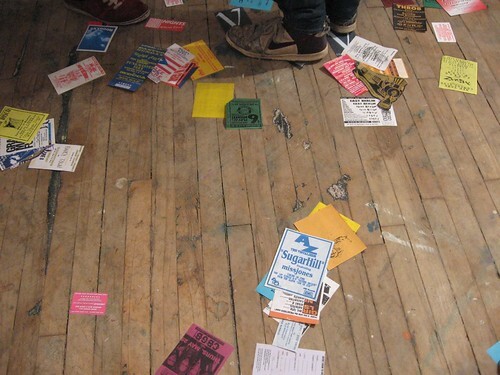 Colt Hausman’s club flyers from 1994-95 found on the streets of New York, collected while he was walking to school in 5th grade. But the Mind of the Collector is what really gets me; the genesis of these desires. Every collection has its story, usually with a pretty casual beginning. An initial find, followed by a close match, and then another, then another… until the collector develops an eye for the item; a connoisseurship that wants nothing more than to showcase them in all their pleasing, candy-aisle variety. Adam Wallacavage‘s Squeaky Toy collection comes to mind, or Jenison’s own accumulation of colorful, plastic-wrapped wine bottles. The desire is contingent, weird, and so specific that it seems to land the collector somewhere on the Aspberger’s spectrum. 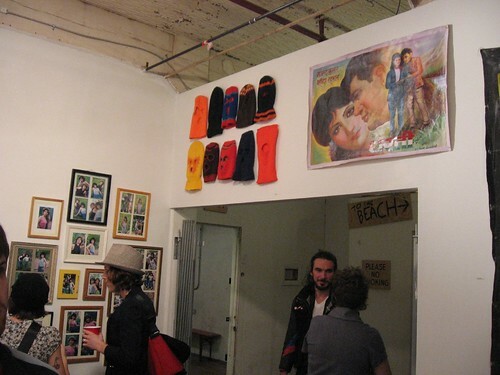 Installation shot featuring the author of this post under Ben Peterson‘s ski mask collection and an example of Alexandra Segreti’s hand-painted movie poster collection. Left is Erica Prince’s best friends collection. 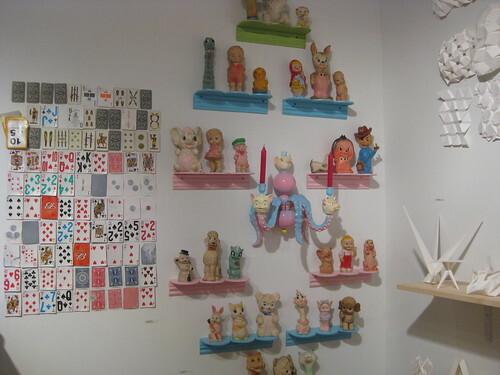 Installation shot, Jeremiah Hensen’s card collection, NY pickups from 2006, Adam Wallacavage‘s squeaky toys, Brendan Kellogg‘s kinetic sculptures with planar and hinge elements. The nice thing about the Collections Show is that it allows us to see the social utility of our imbalanced fascinations. It welcomes obsession; rather than the proportional, reasonable, and loveless way in which we usually hoard our everyday artifacts. 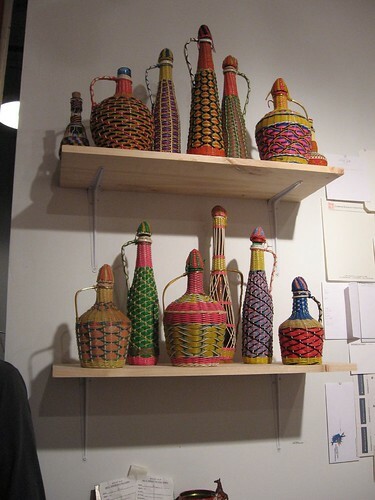 Luren Jenison’s collection of plastic cord wrapped wine bottle collection. 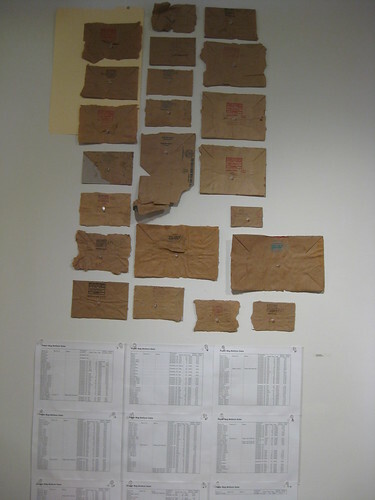 The show’s curator, one of Copy Gallery’s founders, did a wonderful annotated list for the show. 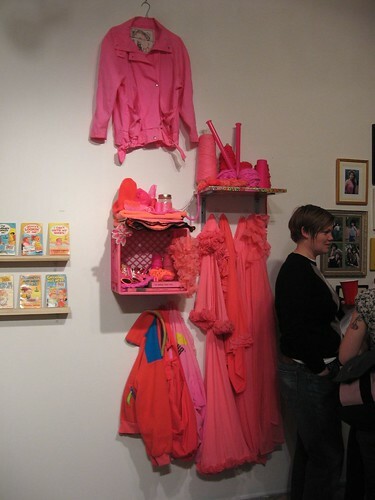 She wrote about her own collection as well: I started finding these neon plastic wrapped wine bottles in thrift stores in North Philly while shopping for stuff for work. The first time I found one I couldn’t believe it was real — so neon and intricate. Then I kept finding more and more. I have tried to figure out where they are from and who is making them. At first I thought it was some crazy lady in her row house who substituted macrame or needlepoint for this wine bottle wrapping. But as I found more in different places, I have clues to lead me to believe that they are from a specific table wine vintner in Spain. —Brandon Joyce is a founding father of PIFAS. We look forward to bringing you more of Joyce’s philosophical musings in the future. Next  Congratulations!!! Three new Philly USA Fellows!